Amy, your professional rugby career began early in Worthing, before you joined Bristol where you had to juggle being a full time, elite athlete and a full time student... "it was definitely challenging, but I've always been quite a busy person; ever since I was 5 years old, I did every after-school club there was, so I think I'm actually a lot more productive when I'm busy. So having something to take my mind off rugby was quite a good thing. I could switch off from training and get on with something completely different"
After your successful stint with Bristol, you were invited into the England set-up to play for the national side full time, did you find that your diet or nutrition changed at all moving from Bristol to the England set-up? "probably not so much with the move from Bristol to England, but definitely compared to when I was a younger player. I think firstly [the change has come about] from taking an interest in nutrition... I wanted to learn about it, I wanted to improve my performance, so it came about naturally - wanting to eat better, wanting to take care of myself, and using those small gains you get through [the right] food. My diet habits, from when I was about 15 to now are vastly different. I used to be more on the chubbier side, but now I eat to perform". Rugby Sevens was introduced into the Olympics in 2016, and it has been quite well document that the final selection for Team GB was a little on the late side; how did you find selection for Rio? "Ohh, it was a tense couple of months in the lead-up. Every other sport or squad was being announced, but we were all just hanging around like, 'ohhh I don't know yet!'. I remember it was after we had a training camp in Wales, and it was the Friday coming home I had stopped to have some food & catch up with a mate from Uni in Bath.... and I remember waiting for 7pm, when I knew the e-mail would come through... when it finally came through, I couldn't tell anyone so I had to go outside and ring my mum... selection for anything in sport is always quite savage because you know that if it isn't you, then it's someone else that will be really upset. At the time though, the group was tight enough to deal with it... some of my best mates weren't there unfortunately, but we're always behind each other." What was it like being in Rio, did you get out much? "So we got to see a little bit, Team GB did such a good job; they had the GB house and stuff so we had places to go outside of the village where we could see family, etc... there was a little bit of time to explore too. We had three days after the tournament finished to catch-up with everything. But ultimately you've got to try to not get too carried away - enjoy the experience, of course, it might be your only opportunity but at the same time you have to remember why you're there. It's easy to think, 'oh there's a pool there, let's go & sunbathe'... we were quite lucky actually that we'd already been to Brazil with the World Series, so we'd seen a bit of Brazil already which meant we could really focus when we got to Rio". The popularity of Rugby Sevens has exploded in recent years, and through the HSBC World Series you get to travel to some truly amazing places; does it ever get hard living out of a suitcase for such long periods of time? "It's something you sign up for when you play... you can't play without travelling and I think that is part of the beauty of it. You really get to see the world, you get to go to places you'd never normally go... it can be tough sometimes, living out of a suitcase for three weeks, but you're there doing what you love with your mates"
Tom Mitchell, the England & Great Britain Captain came down to the studio and said that most people would love playing Sevens, because you can more or less eat what you want; you just have to get as many carbs into you as possible... "Yeah, though I'm probably not blessed with quite such good genes as Tom, I have to sometimes watch it! But yeah, you do need a lot of energy as it's so hard... the competition is hard, which means the training has to be hard. You've got to make sure you have enough energy to keep going. You do have to watch what you eat to an extent, it's a balance.. when you're running around in 30 degree heat you don't want to be carrying around any extra fat... its all about finding out what works for you and sticking to that." Because of the nature of the World Series, you have been to some incredible places; do you have a favourite place to compete? "Dubai was my first World Series, and I love going there because the crowds are amazing and my Mum and my Step-Dad go every year, so it's one I look forward to. 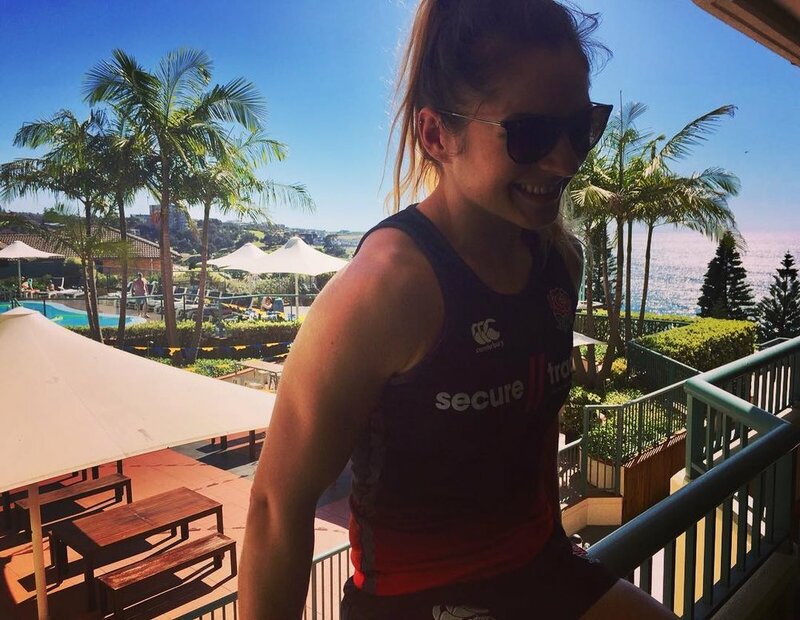 I'd love to see England back on the Womens Series, as it'd be nice to have your friends come and watch you". Rugby Sevens was added to the Commonwealth Games in 2018, and you got to fly out to Australia to compete, and you picked up a bronze medal; how did that comp compare to the Olympics or the World Series? "It was fantastic, and to come away with something (bronze medal) after the heartbreak of Rio (4th place) was really good. When we were playing out there... the Aussies really back their Sevens teams so there were sell-out crowds to every game and our second games was against Australia and you could really feel the energy... I remember running onto the pitch and I couldn't help but have this massive Cheshire-cat smile on my face. I think that is probably the main difference compared to some of the World Series, where we don't get quite so much support. Its all the same teams though, and it's always competitive so once you are playing and in the moment it's much the same as any other tournament"
It was announced, not too long ago, that the RFU would switch its focus more from 15's to Sevens; as someone who has played at the top level in both sports, how do you feel about this change in focus? "It's hard to say because you can only deal with the scenario in front of you, and there's nothing to compare it to. I think we'll get to a point where you need to differentiate between the two sports more, because they require very different types of fitness and.. though the skill sets completely crossover and you can get some fantastic players capable of playing both, I think for the sake of the development of both games, you need an equal focus on both but taking them separate ways". We've spoken about your success in Sevens at the Rio Olympics 2016 and Sydney Commonwealth Games in 2018, but you were also competing at the World Cup in Ireland in 2017, how was that? "Yeah, it's always tough to fall at the final hurdle but what an experience! I'd 'been-there' through Sevens, but to switch disciplines, and have the opportunity to play it such an unprecedented event was phenomenal. Plus to play with people who had made the final before and won it, it was a privilege to play with them." After falling at the final hurdle, after just missing out on a medal or a win, how do you pick yourself up again? "I think with Sevens, you are constantly having to pick yourself up - you have 6 games in 2 days and if you don't recover mentally and physically you're going to be useless for the next game, so I think that is a skill you need to learn - to be able to bounce back after a tournament is quite easy as there so much more time"
You've played in some massive games, in some massive tournaments; are there any that really stand out? "Well my 15's debut is the most memorable; my Mum and my Step-Dad had come out to America to watch me play. I was a non-playing reserve for the first game, and they were leaving the day after the second game which was my first cap... the day [of the game] we'd gone out for a warm up and a tornado came, so we were all ordered inside, as far into the middle of the building as possible, all our friends and family, plus both teams were crowded into this little corridor... the next thing we know, the game is postponed to the next day, which is the day my family were leaving, they were crying, we didn't know what was going on!? We worked out that, based on the new KO time, they might just be able to see my game as long as they hugged me an left right at the end of it and went straight to the airport. The fact they got to watch it, and I scored made it a special occasion. The Sevens one, all I remember is not having a clue what to do and running around like a headless chicken!". Finally, lets throw in a quick diet/nutrition question. What is your cheat meal? "Actually one thing I do after I come home from abroad after a World Series, is have a Domino's pizza... I have a blow out... pizza and a Krispy Kreme"
Follow Amy on social media to keep up to date with her career, find her on Instagram and Twitter.